If you are one of those who have considered or are still considering whether to keep a hedgehog as a pet or any other wild animal for this matter, should be well-acquainted with their habits in the wild. This will make sure that you will have a happy, satisfied pet while the animal is under your care. Finding the best hedgehog accessories is one of the things that you need to keep in mind to achieve such a goal. Read to the end to find out more about this hedgehog necessity. Why Do Pet Owners Consider a Hedgehog for a Pet? It is only in recent years that many animal lovers have started bringing one or more of these unique creatures to their homes. Although many are still divided on the idea of keeping wild animals as a pet, still many have found that these small animals can easily be domesticated and can actually be good great companions once they are housed and are provided with their basic needs. These nocturnal animals display unique behavior that seems to capture the attention of their would-be owners. The average life span of this unique species is from about four to six years, and they can weigh to up to about a pound. They are usually fed with a low-fat dry cat food for hedgehog supplemented with vegetables, mealworms, crickets, and other similar meat sources. They are usually kept in a large, flat-bottomed cage. Even though this animal usually remains silent throughout the day (it sleeps during most of the day), it can be easily startled and display some of the most unique reactions. This super-sensitive creature will readily show its emotions when it is frightened, angry, or otherwise with the unusual cover on its body. Its quill, which is usually flat when it is unmoved or calm, straightens up and makes him look like a ball of spikes. Not only does a hedgehog may look unusual at times, but it can also behave differently when in a different surrounding. This small furball has a great sense of smell and it readily responds to a new scent by licking it, creating a frothy liquid on its mouth, and rubbing it onto its whole body. Who does that? Weird, right? Honestly, I do not know why hedgehog owners find such a behavior cute. Actually, they do this to mask their scent with the surrounding scent. Apparently, this will make them less vulnerable as they might be taken as one of those in the pack, especially of their predator relies on the scent of its prey. The first thing that you need to make sure of is the health status of the animal that you intend to adopt. Keeping an unhealthy hog will soon create a lot of problems for you, even more, if you decide to breed hedgehogs later on. Even before you bring home a pet, you need to make sure that you already have a housing prepared for it. Its enclosure needs to replicate its original habitat as this will make your pet feel more comfortable. Remember that the happier and more satisfied your pet is, the longer it will live healthily, hence will not cause you much trouble. Not only do you need to make sure that its next home will provide it with the comfort it once enjoys in its original habitat, but you can also actually enhance it to make living a little more gratifying for your small pal. Remember that your soon-to-be pet is a very active creature. To ensure that it will not get bored while inside its cage, you can add in a few simple items that will keep your pet occupied. Hedgehogs love to sleep in dark enclosed spaces. That is the reason that you may have found your pet burrowing in the ground. When looking for a hideout, make sure that it provides enough space that will allow the hedgehog to turn around when moving from one exit to another. Your pet enjoys long hours of sleep. Let it feel more comfortable by keeping them warm inside a fleece sleeping bag. Buy more than one, so you can easily replace a soiled bag whenever necessary. You need to make sure as well that there are no loose threads in the fabric as this may endanger your friend. You can easily transform a shoebox into a hideout. Use pipes with large diameters as tunnels inside your pet’s enclosure. 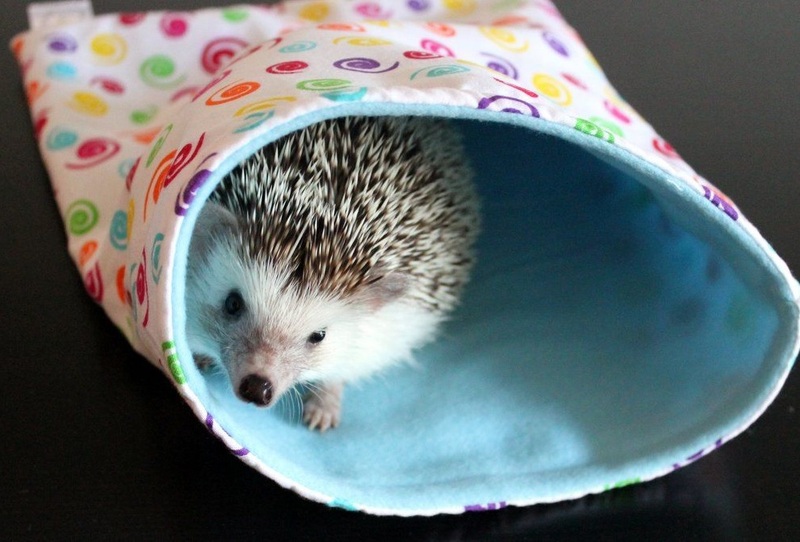 Your hedgehog will surely have some great time going in and out of these DIY tunnels. Allow your pet to get more enjoyment as it explores its surroundings while enjoying an exercise ball. These are just some fun and creative way to keep your hedgy busy. A cage wheel is another healthy addition to your hedgehog cage. Your pet will love running around one. It can go on and on for hours and will just stop once in a while when it is exhausted. Just make sure that there are no spokes or uneven edges on it and that it has enough ledge that can keep your pet safe while running on it. How do you intend to keep your hedgehogs busy while it is awake? Which of these accessories do you in your pet’s cage? Which you would rather not have in your pet’s cage? Why?